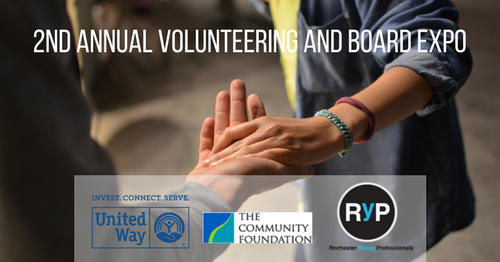 RYP 2nd Annual Volunteering and Board Expo | Rochester Young Professionals, Inc.
Join us at our 2nd Annual Volunteering and Board Expo as we present over 100 community organizations seeking volunteers and board members. You’ll have the opportunity to speak with representatives of these not-for-profits to learn about their needs and how you can help! This event is made possible through generous sponsorships from the United Way of Greater Rochester and the Rochester Area Community Foundation. This event is coordinated in partnership between Rochester Young Professionals, United Way of Greater Rochester, the Rochester Area Community Foundation, and Roc City Coalition. Free parking is available behind the Temple. Attendees should use only the rear entrance of the building and follow the signage to the event. For security reasons, all other entrances will be locked.